Apr. 7, 2015 8:00 a.m. If you’re “aging in suburbia” or on the crest of the “Asian new wave,” you’ve got plenty of company in Metro Vancouver. Those are two of the most prevalent demographic profiles in the Lower Mainland, according to a new neighbourhood-level analysis released by marketing firm Environics Analytics. The firm has assigned one of 68 lifestyle profiles to every postal code area in Canada, based on the age, ethnicity, income and other attributes of residents. 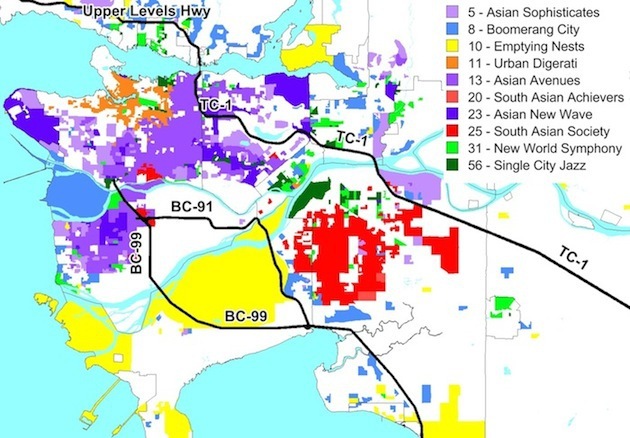 The firm generated two maps of the Lower Mainland at the request of Black Press – one showing the profiles with the highest concentrations within the region (see above) and a second (below) depicting the most culturally diverse areas. “Aging in Suburbia” – a profile dominated by older, upper middle income suburban couples and families – is found mainly in Langley, Maple Ridge, Abbotsford and parts of Surrey. The “Urban Digerati” are concentrated mainly in downtown Vancouver, Yaletown, Kitsilano and South False Creek. They’re branded as young, highly educated and tech-savvy singles, tending to live in high rises with six-figure incomes. The group typically hasn’t started families and has the time and discretionary income to lead active social lives that include dancing, bar-hopping, hitting film festivals and food and wine shows. “South Asian Society” – a blend of Sikh, Hindu and Muslim immigrants who have arrived since 1990, occupying large swaths of Surrey and Abbotsford, with smaller pockets in Richmond and South Vancouver. They’re middle-aged, average earners who diligently invest for their kids’ education, and they’re more likely to live in multigenerational homes and work in manufacturing, trades, sales and service. “Asian Avenues” – Successful, middle-aged and older Asian families that make up a concentrated band that dominates Richmond, south and east Vancouver, and parts of Burnaby. Tends to include older immigrants from China, as well as the Philippines, Vietnam and South Asia. “Asian New Wave” – Younger well-educated Asian singles and families that enjoy an urban lifestyle, found in pockets of Burnaby, Point Grey and Richmond. This profile consists of mostly foreign-born immigrants with modest incomes but good educations, often holding jobs in the sciences, business administration and sales and service.